This is Part 4 of a 10-part Must Have blog series about Wellness Technology. No matter what your organization does, or where you fit within your organization, there likely has to be a business case for money you wish to spend (Okay, I take that back…this applies to well-run businesses and non-profits but most are, right?!) - wellness programs included. It can be difficult to determine exactly what to measure and how to report results and unfortunately, it’s not always a simple answer. To present your case and ‘pitch’ it to leadership, learn how to sell wellness to C-Suite. One undeniable fact about wellness is that it takes time to prove return on investment (ROI). You could expect a good return if you take all of the correct steps as defined within WELCOA’s Seven Benchmarks of results-oriented workplace wellness or by following the “Results-Driven Wellness” strategy as taught by Chapman Institute's Wellness Certification Program but proving wellness program ROI has its challenges. The Rand Wellness Program Study estimated an overall ROI of $1.50 for every dollar invested in wellness programs which isn’t mind-blowing; however, this study didn’t factor productivity improvements from lifestyle management where benefits are realized in the longer term mitigating longer-term health risks and absenteeism. But, disease management saw a significant return of $3.80 for every dollar spent which provides savings in the short-term. RAND Survey Recommendation: Employers need to be clear about goals for wellness programs to determine their ROI. However, you can read another research survey (and there are many!) and get different results. 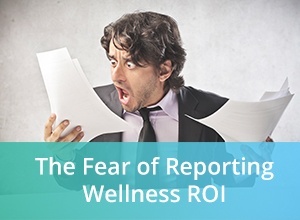 What I find interesting is that so many wellness leaders avoid seeking any type of ROI because they’re concerned that their program will not measure up. We need to change this way of thinking!!! In today’s age of design thinking, it's much better to learn early, face results and then use continuous improvement so that, by the time the day arrives, you will be confident you will achieve the ROI of your dreams. That day is a long ways off if you are either early into your wellness program or you are aspiring to follow a results focused methodology. Regardless, not many executives are keen on taking a ‘wait and see’ attitude for 3-5 years to hear how your wellness program is doing. You still need to justify your program in the meantime to ensure its viability. HOW CAN YOU PROVIDE VALUABLE RESULTS? First, begin with the end in mind - determine what results you want to achieve from the start. Every company, and possibly every executive, is interested in different stats to measure so it’s important you determine and agree on them from the start. Program Participation - We all know that if people aren’t participating, you aren’t getting results. Therefore you will need to pull various types of data out of your wellness platform including how many people logged in, how often, how many participated in activity, and other interventions. Tip: Program participation should be readily reportable with a breakdown by program, location or work group from your corporate wellness platform. Employee Engagement - In addition to just usage, there are other key measures of interest. Perhaps your executive team is interested in employee morale, or the general happiness of employees. Employee engagement surveys, shown time-over-time alongside your wellness program results, are helpful to present your business case. 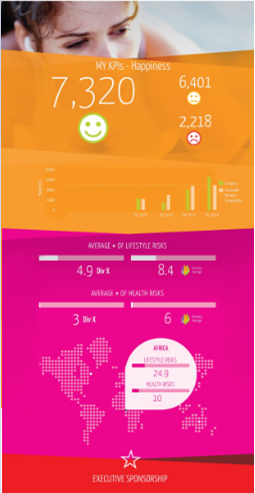 Tip: Your wellness platform should easily assist you in gathering employee engagement statistics. 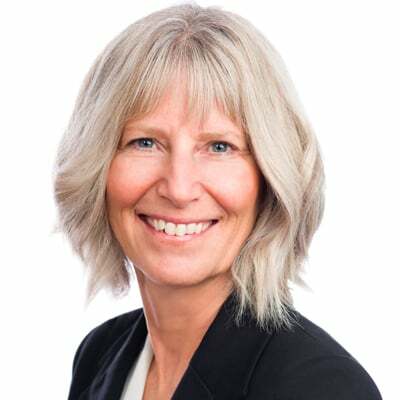 Absenteeism – The Sun Life-Ivey Q3 2015 Canadian Wellness ROI Study suggests that firms can save about 1.5 days in absenteeism per employee over a 12-month period or an estimated $251 per employee per year in savings. This in line with Harvard's U.S. results which found savings of 1.7 days per employee with an estimated savings of $274 generating a ROI of $2.73 per dollar invested in wellness. Reducing absenteeism can be a valuable statistic to measure. Employee Feedback – While employee feedback is a ‘softer’ measurement, it’s still very important to help gauge success – if employee’s loved (or not) the program, you need to know for next time. Tip: Be sure your wellness platform allows you to configure and deliver custom polls and quizzes. HOW DO YOU PRESENT RESULTS? Ideally you present the information to your program stakeholders in a format they are accustomed to. Visual graphics (see image) is great to relay information. Make sure you are clear on your wellness program objectives before you start. Determine a beginning benchmark (or goal) for each stat you wish to measure. Measure results upon program completion and compare to your benchmark – are they better or worse than expected? Present results in a visually-appealing format to leadership (including any employee feedback). Develop an action plan for next steps/new programs. The CoreHealth corporate wellness platform helps you report and present your wellness program success quickly and in a variety of formats - including a visually-appealing format loved by wellness providers around the globe. See it in action.